Now, when it comes to cultivating awareness (of the spirit), yes spiritual practice is important. I have clients from all walks of life, who are spiritually aware in different degrees. But to all of them I say the same thing: “Get your basics right!”. All too often we try to do too much at the beginning and end up not doing anything… Moderate but constant effort is primordial! So here are my 5 basics. I apologize in advance to my Facebook followers for some repetition… If you are not a follower yet, but would like to become, click on the link https://www.facebook.com/pages/Shaman-Tracker/324014247720450 and ‘like’ my page. Please feel free to share any comments or links either here on my blog or on my FB page. WP bloggers don’t hesitate to share your links if your blog is related to any of my 5 basics, I would love to hear from you! 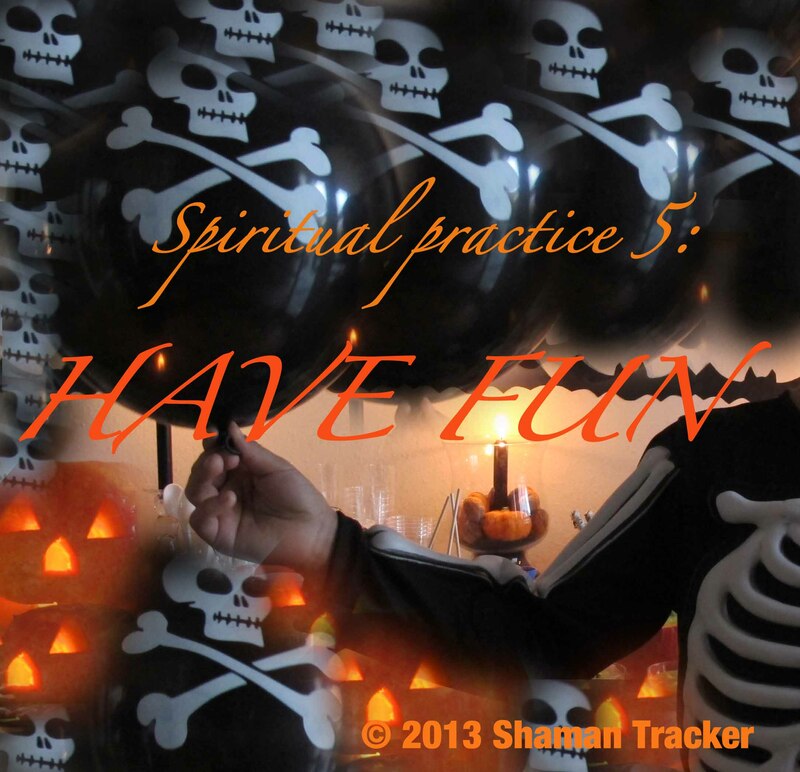 I am not sure who and when it has been decided that we cannot be spiritual and have fun… Hmmmm. But I couldn’t disagree more! Some of the most spiritual people also have the greatest sense of humor. Having fun enlightens me, i.e. it makes me feel lighter. I believe that truly spiritual people are light on themselves and others, and are a pleasure to be around. Even when I am in my lowest of moods, I love when somebody says “Let’s do something fun today.” Having fun lifts my spirit. They say that fun is the food for the soul. When I say have fun, I mean good old fun, i.e. fun for fun’s sake without an ulterior (spiritual) motive. I mean fun activities you can lose yourself in. By the way, I am not promoting drinking or shopping until you drop here 🙂 . Or any kind of indulgence… for that is the sure way to end up on the wheel of pleasure and suffering (read my very first post All you need, All the time – for adults only 🙂 !). I am rather talking about taking the time to do activities and to spend more time with people you enjoy. I am talking about seeking to be playful, silly and laugh more. I am talking about learning to take life and yourself less seriously. Picture this: painful and long dental procedure. There was nothing spiritual about me sitting in that dental chair this morning. I felt like I was gonna suffocate and couldn’t wait to get out of there… I did remember to breathe as it really helps alleviate anxiety, and I tried some autosuggestion and hypnotic exercises to soothe myself. But nothing worked better against anxiety than making fun of myself. I suddenly remembered the movie Charlie and the Chocolate Factory, and the young Willy Wonka in torture-like braces enclosing his head to prevent him from eating candy. This image kept me amused and I left the dental office happier than I came. All too often we do not take time to have fun because we have more important things to do. Or because we believe we have to be a certain way to feel or look spiritual to others or even to ourself. I loooove to laugh out loud, I still do that and I’m not the slightest bit embarrassed of the looks I sometimes get (The laughing shaman 🙂 . I love photography, I love to paint, I love my girlfriends, and my men, I sometimes enjoy a morning coffee (even an unhealthy one from a known coffee chain), I love fashion and dress nothing like people imagine a shamani to dress (no I don’t have long hair, I don’t walk around dressed in black, or wearing long skirts, with my rattle and feathers, but I have great love and passion for my work), I love kids and ‘being one of them’, I love writing poetry and roller skating, I am in love with the ocean and the wind, I love life and living and I also love working with spirits, with those who have passed on and those who will come. It is her post that has partially inspired my 5 Spiritual Practices series! This entry was posted in nature, planet, quote, shamanic tracking, shamanism, spirit, spiritual practice and tagged ancestors, breath, child, children, death, earth, exercise, food, friend, fun, healing, honoring, life, meditation, nature, planet, shaman, shamanic journey, shamanic tracking, soul, soul journey, spirit, spiritual experience, spiritual journey, spiritual practice, spirituality. Bookmark the permalink. Wonderful post, and as you say the most important thing in anything you do is ‘have fun.’ All aspects of life are so much better if you can find the fun and happiness in what you do…and your first 4 points help get you there quicker. Super, super post! Thanks. I love this saying from the Dalai Lama: “Man surprised me most about humanity. Because he sacrifices his health in order to make money. Great post! Thanks for the mention. Thank You! We are all here to live in joy……..and so many do not understand this. Love what you are saying, doing. I am so happy you happened across my blog and I found you. There are no accidents…….My spiritual journey began with nature, and what a long and perfectly imperfect path it has become. Every day offers something new, for those who wish to see……. The goal of meditation is to ascend from Sat (mere existence) to Chit (consciousness) to the ultimate, Anand (Bliss). Thanks for the reminder.